Winter weather is my favorite, but my skin doesn't always feel the same way. My usual normal-combo skin goes way too dry in the fall & winter, and my lips can easily do the same if I don't keep them exfoliated & super-hydrated. My lips were starting to feel a little flaky the other day (after not enough lip balm & too much matte lipstick), so I came home & had the urge to create my own exfoliator. Just two simple ingredients are all you need, and you are on your way to smooth, hydrated lips. 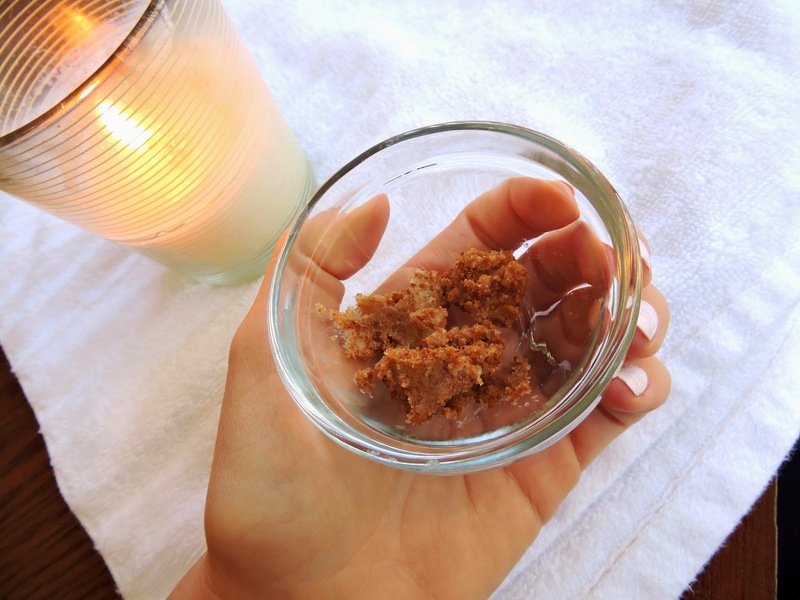 Coconut sugar makes the perfect light exfoliator to get rid of dead skin cells, while the coconut oil leaves a light coat of moisture behind to soothe irritated skin. I think this is great to keep on hand at home for anytime dryness hits-- but it would also make a great little holiday gift! Mix up a batch of your coconut lip scrub, divide it into little pots or jars, and tie it up with a cute ribbon! *Feel free to make more or less-- just keep it to a 50/50 ratio! Soften the coconut oil to about room temperature (your coconut oil may be more or less firm depending on the temperature in your home- but you want it soft enough to mix with a spoon). In a small bowl, combine the softened coconut oil with the coconut sugar until thoroughly mixed. Use your finger to scoop out a small amount of product. Massage the scrub into your lips using light, circular motions. Use a damp cloth or your fingers to remove the excess, allowing a layer of coconut oil to remain on your lips. Follow up with lip balm of your choice to keep the hydration sealed in.